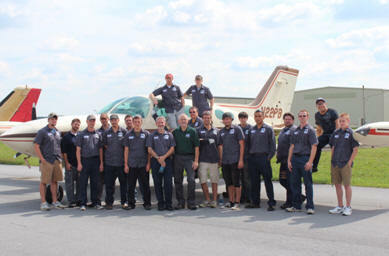 September 11, 2013 - Northrop Grumman Corporation donated two Cessna 400 Series aircraft for training purposes to the Georgia Northwestern Technical College, in an effort to continue the company's commitment to the educational development of future science, technology, engineering and mathematics (STEM) engineers. Georgia Northwestern Technical College offers a two year degree, diploma and certificate programs in aviation maintenance technology. Georgia Northwestern offers students hands on training with aircraft repair of power plants, reciprocating and turbine, their systems and components and airframes, metal and wood, their systems and components. Completion of their programs entitles students to participate in the FAA power plant and airframe examinations and certification processes. The donation of the Cessna aircraft will further the college's ability to provide their students with hands-on training in aircraft maintenance, as well as in obtaining aircraft maintenance certifications. Shawn Purvis, vice president of Northrop Grumman's Integrated Intelligence Systems business unit said "Northrop Grumman is honored to contribute to the development of tomorrow's aircraft engineers. Through our longtime partnership with the Georgia Northwestern Technical College, it is our pleasure and privilege to support them in enhancing our country's STEM workforce." Both aircraft were highly modified to perform aerial mapping work using high-speed digital camera systems and laser equipment. They were capable of detailed topographic survey mapping. The aircraft will be used to train students to operate aircraft on the ground, taxi procedures and safety training. They will also be able to perform airframe and engine inspections.